This gathering on the second Sunday of every month is considered to be one of the best on the West Coast. It attracts as many as 2,500 vendors and 20,000 shoppers. Find clothes, shoes, jewelry, sunglasses, ceramics, glass, furniture, pictures, crafts, keepsakes, art, fabric, bikes, costumes, music — every imaginable type of merchandise. It’s open rain or shine. There’s no admission after 3 p.m., plenty of free parking, lots of food (from cheeseburgers to sushi), and even celebrity sightings. 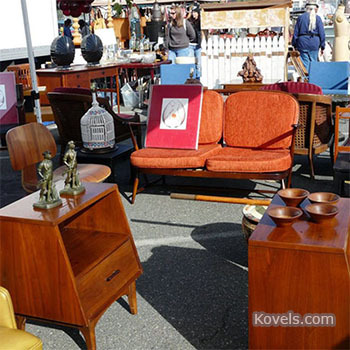 The Long Beach Antique Market calls itself “The Flea Market with Style.” More than 800 sellers with a huge selection of antiques, collectibles and everything chic, cheap, unique and vintage, all at bargain prices. Find collectibles, home decor, jewelry, furniture, vintage clothing and more. The sale is spread out over 20 acres at the Veterans Stadium in Long Beach. Come rain or shine. Admission is $6 (6:30 a.m. until 2 p.m.), early admission (5:30 a.m. until 6:30 a.m.) is $12. Shop until 3. Friday 4 p.m. to 9 p.m.; Saturday 10 a.m. to 6 p.m.; Sunday 10 a.m. to 4 p.m. This event is the largest indoor antique and collectors’ sale of its kind in the Inland Northwest with 200 dealers participating from all over the west coast. Shop among thousands of vintage treasures rare to retro, including kitchenware, industrial, estate and costume jewelry, furniture, primitives, rustic garden, elegant glass, shabby chic, prints, and more. Find antiques in all price ranges for the discriminating collector to the treasure hunter. Enjoy quality authentic antique and vintage shopping featuring dealers from 15 states. There will be dealers selling jewelry, postcards, primitives, 1950s dinettes, furniture, western, art pottery, art glass, comic books, Native American, vintage clothing, toys, lighting, cameras and much more. Early Buyer’s Day is Friday, April 26, 10 a.m. to 5 p.m. Admission is $10 for adults and it includes admission all weekend. Regular festival days are Saturday 9 a.m. to 5 p.m. and Sunday 10 a.m. to 4 p.m. Admission is $6 for adults; $3 for children ages 9-12; ages 8 and under are free. Free parking. (Hint: purchase Friday tickets online for half price.) And look for other Rocky Mountain Antique Festivals in Loveland, Colorado, July 14 and 15, 2018; and in Colorado Springs, Colorado, July 21 and 22, 2018. California’s largest antique show, the show is called the “Brimfield of the West.” This is the place to shop for vintage, retro and antique home decorations, clothing, furniture, jewelry, art, pottery, books and collectibles. All items are 20 years old or older. Open 9 a.m. to 3 p.m., admission $5; early buyer admission 6 a.m. to 9 a.m., $10. There is free parking and a shuttle. The San Jose Flea Market is one of the world's largest. More than 2,000 booths fill 40 acres with treasures for all. Everyone will find something to love in the colorful, treasure-laden alleys and corridors – jewelry, fashion clothing, furniture, fine collectibles, comic books, tools, belt buckles, books, toys, and baseball cards And there are food carts, pony rides, live music (Mariachi bands and crooners) and other entertainment. Open Wednesdays, Fridays, Saturdays and Sundays, from dawn to dusk (there is a holiday schedule). If you’re a first-timer, weekends are the best. Admission is free. Parking is free on Wednesdays and other days before 9:00 a.m.; otherwise, Friday is $3, Saturday is $7, and Sunday is $10. We love it when readers share what they love and enjoy. Let us know what your favorites are!